The Steamboat Springs Pro Rodeo Series is a perfect way to experience some of our deeply rooted Western heritage. With cowboys and dirt galore, you will see bucking bulls, barrel racing and more rodeo events, including lots of clowning around from the hilariously funny rodeo clowns. If you love Western apparel, then you have come to the right place. You are sure to find that perfect souvenir for a loved one or that perfect pair of boots for yourself. We are lucky to have one of the oldest Western retail stores in the area. Passed down through the generations F.M. Light & Sons is a must visit. They have hundreds of boots and hats to choose from. Happy shopping! Our local cowboys know their stuff here in Steamboat. Whether you want to sit back and relax in a horse-drawn wagon, or step up your game and experience riding your own trusty steed, there is something for everyone to enjoy. Choose from a 2-hour horseback tour, single day or a multi-day pack trip through the pristine scenery of surrounding wilderness areas, you won’t be disappointed. Suitable for the whole family. This Is Not Just Any Vacation…..
Want to stay at a truly Western guest ranch? Experience gourmet dining, horseback riding, fishing, and more as well as beautiful accommodations tucked away in North Routt County. Vista Verde Guest Ranch and the Home Ranch are definitely worth the visit. Head To A Working Cattle Ranch For A Day of Adventure! Being involved in a real life cattle drive is sure to get your heart racing. The cattle, the dirt flying, and the cowboys provide for an exciting day on a working cattle ranch. 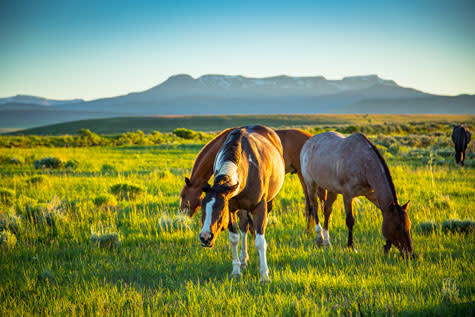 You can choose to do a 2-hour relaxing afternoon horseback ride or opt for the 4-hour cattle drive. Either will reward you with great scenery and endless memories. Whichever Western adventure you choose in Steamboat Springs, you are guaranteed to leave with a sense of deep appreciation of our Western heritage that will bring you back to Steamboat time and time again.